Before Pooja qualified as a Dental Nurse in 2014 she had a wonderful career with Gulf Air as cabin crew, where she travelled all over the world meeting people from different backgrounds. Her friendly, welcoming personality and love if customer service saw her quickly promoted to Senior Crew. Once settled in the UK, Pooja decided to use her skills to help patients transform their smiles! She believes that a beautiful smile is an essential part of someone’s personality and self-esteem. 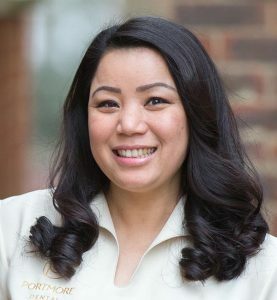 She joined Portmore in 2017 and her primary responsibility is to provide chairside assistance to dentists and reassurance & support to our patients. She loves being a dental nurse as she is able to meet and interact with new people. Pooja is passionate about her career development and ultimately would like to move into a customer service & management role at Portmore where she would have a direct impact on the business. Outside of work Pooja loves cooking, trying new dishes and eating out! She also loves travelling and experiencing new cultures. We asked…What is your top tip for a healthy lifestyle?